Trainer is nice as it keeps you in shape. One thing I do so I don’t have it lying around; I have it at a local indoor cycling venue. Mind you it means leaving the bike there, which probably means no commuting on the nicer days. Also, studded tires are *AWESOME*. I run ice spiker pro’s on a mountain bike in the winter. I literally stick to ice like I’m glued to it. They are at the high end of studded tires; but there’s some reasonably affordable ones out there for hybrids. Another suggestion is to get more than one bike. 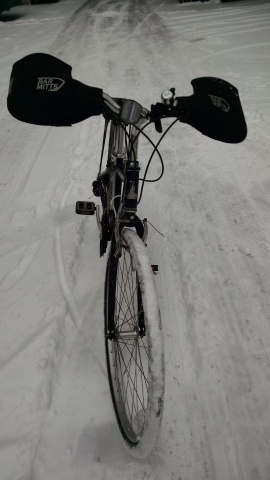 Have studded tires on one, have regular tires on another, then you’re set for commuting. Some good suggestions here Big Red. I’ll have to look into studded tires for more stability for my current hybrid. I don’t mind keeping them on for the whole winter even though it will be more challenging to pedal. It is just a concern for me that people don’t know how to drive with bicyclists on the road and there might not be enough room on the road for me in the wintertime. For now, I’ll enjoy my “break”. Also, I’ve seen some Ski Bikes that look like fun.